OMG! I love this place! Where else can you dine on fabulously ethnic cuisine while watching wild African giraffes, zebras, ostrich, wildebeest and more. The Disney Imagineers that created this place should get a medal. Ok – I’m finished gushing about the most interesting dining venue I’ve ever encountered. From here on out I’ll attempt to give an unbiased account of the cuisine, service and overall ambience of this rugged beautiful restaurant situated in Kidani Village. 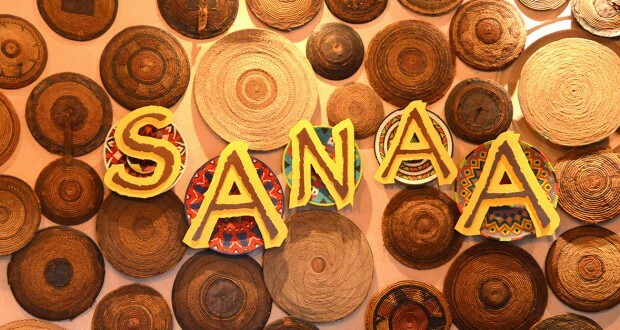 Sanaa is one of the Restaurants you’ll find within the Kidani Village which is part of the Animal Kingdom Resort area. 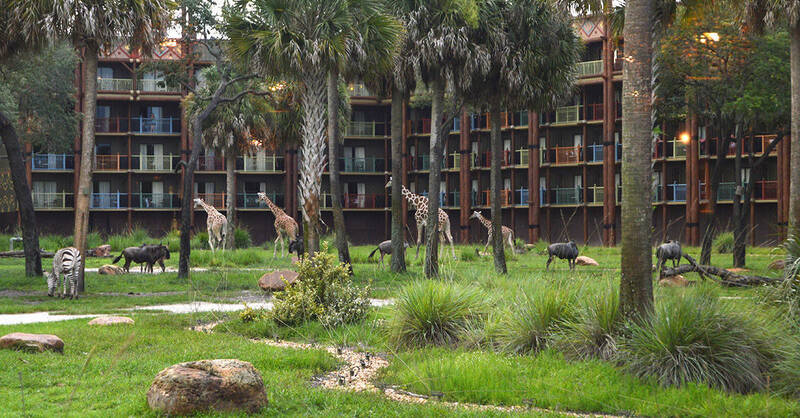 The surprising part of this dining experience is that you sit literally feet away from an array of wild African animals. One of the highlights of our meal was when I looked up from my plate and saw a baby zebra with its’ mother nursing literally 3 yards from the window where we sat. Add to this panorama of animals a dining room full of dark woods, African decor and warm lighting and you’ve got a recipe for Disney success as I once again am amazed by how thorough Disney Imagineers pull together a truly unique experience that is unparalleled at Magic Kingdom in Florida. The view out our window would be enough to inspire a return visit, but Sanaa outdoes itself by offering an array of tantalizing cuisine. With a very diverse yet somewhat foreign menu, to those of u that don’t frequent Ethiopian or Indian restaurants, be prepared to settle in and do a little menu reading to get yourself up to speed on the mixture of cuisine’s. The first dish to grace our table was not on a dish it all, but rather a large slab of finally sanded Hickory wood with three different types of Indian style bread. The bread, mostly variations of Indian flat bread were accompanied by nine different types of dipping sauces, ranging from mango and jalapeño chutney to red pepper hummus. Indulging in the Indian style bread service was a deliciously adventurous experience. I’ll admit some of the accompaniments were not quite to my liking, especially the super hot ones, but with nine different choices of dipping sauces and chutneys, everyone in your party will find something that they adore. The bread service was followed by an appetizer – a Goan Style Crab Cake with tamarind yogurt made with 100% backfin crabmeat. 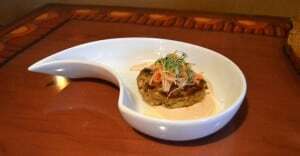 The only filler added was a sweet African bread which makes the crab cake a little sweeter than expected flavor – delightful! 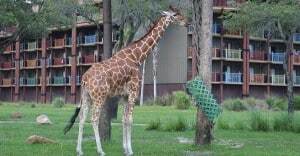 I look up from my plate and see a giraffe walking towards the window where I’m sitting. It’s obviously feeding time in the game preserve so looks like it’s dinner time for them as well as us! Okay, I’m back. 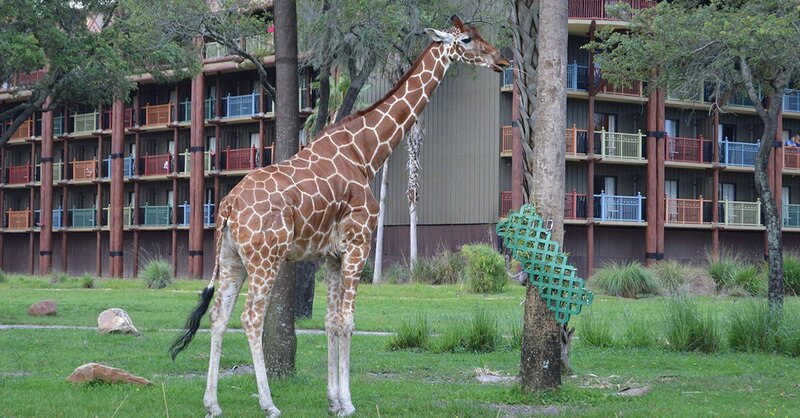 I ran out to the outdoor observation area to get a few photos of the giraffe that wandered past our window a few minutes ago. The next items we ordered from the “Slow cooked and gravy – simple and well seasoned” area on the menu. I’m not joking that’s exactly what they call it. 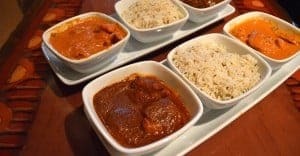 Diners choose a couple of the following for your entrée: Butter Chicken, Spicy Durban shrimp, Chicken vindaloo, Goan Seafood Curry and Beef Short Ribs. We chose Butter Chicken, Beef Short Ribs and Spicy Durban Shrimp for our table. The Short Ribs were tender and flavorful and the butter Chicken was delectable enough that my husband closed his eyes with most every bite to savor the moment. The Spicy Shrimp were cooked perfectly with just enough heat to satisfy a spice-lover’s craving! Each of the above is paired a choice of either basmati rice or 5 grain pilaf. 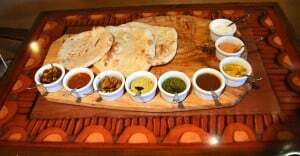 We also ordered more naan flat bread to accompany our meal having enjoyed the bread sampler so much! Sanaa – not pronounced “Sauna” but rather the accent is on the last set of “a’s”, also offers an extended menu of loose leaf teas as well as desserts, coffees and frozen cocktails. We were far too stuffed to order dessert ourselves but our server swears by the dessert trio including the chocolate mousse banana cheesecake and seasonal Kulfi. An extensive kids menu is also available and includes items like fish of the day, grilled chicken breast with rice and then a pan seared shrimp for kids with an adventurous palette. More familiar kid’s entrees include turkey burgers, cheese pizza, and meatloaf. 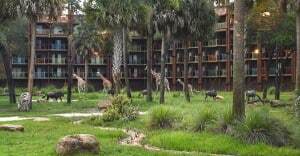 Bottom line, I would highly recommend Sanaa as one of the most unique dining experiences in all of Disney World Resort especially if you’re an animal lover. The service here was excellent, what we have come to expect from a Disney restaurant, and considering the exotic cuisine, our server patiently answered all of our questions and excitedly introduced us to other exotic dishes we decided what we wished to order. Sanaa was altogether an experience I will remember for years to come. Entrées range in price from $16 to $29 for dinner. Disney Dining Plan is honored here and reservations are highly recommended. Sanaa is also open for lunch.